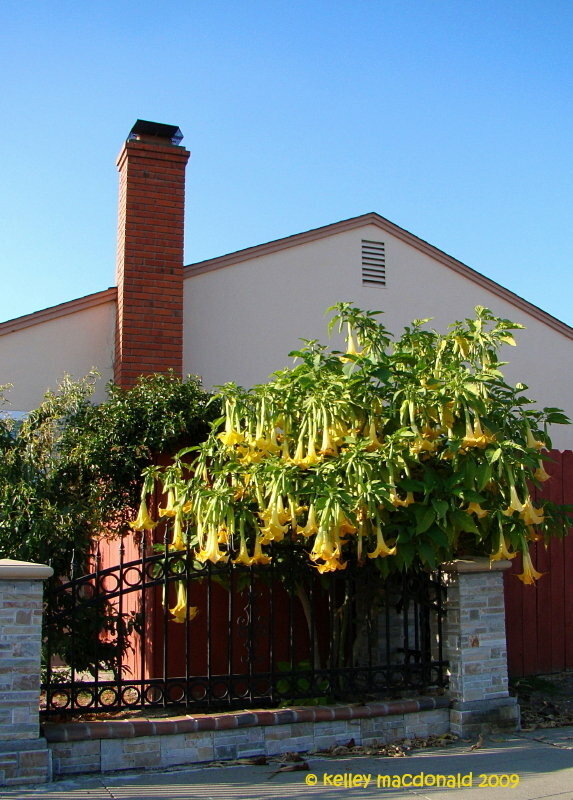 My Charles Grimaldi is about 10' tall. 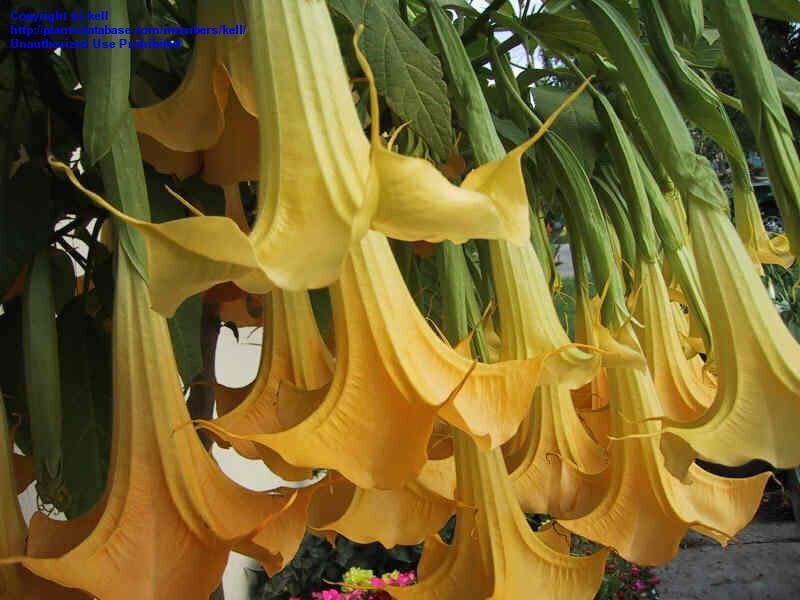 During flushes spring and fall it is covered hundreds of blooms ..I can't count how many! 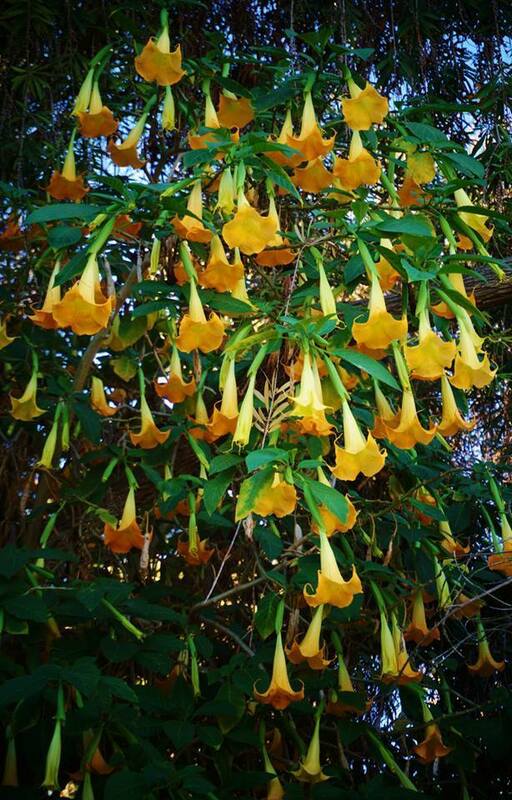 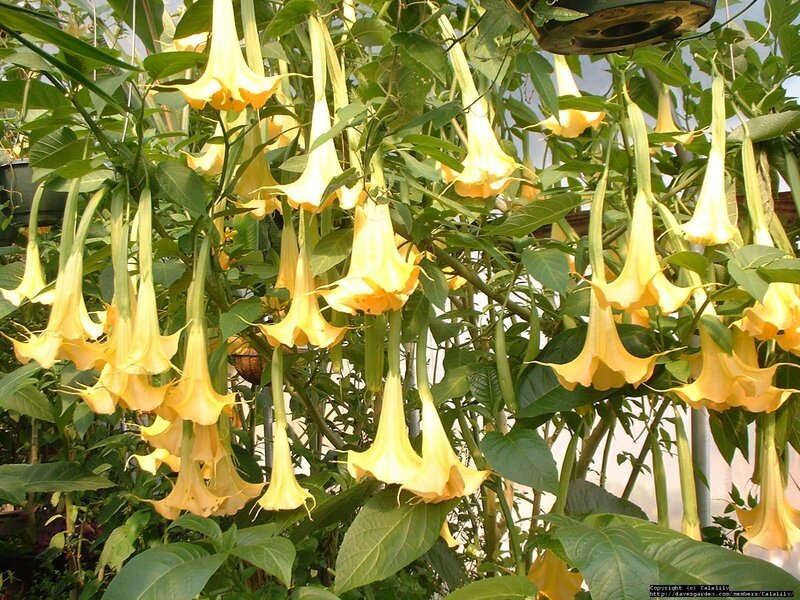 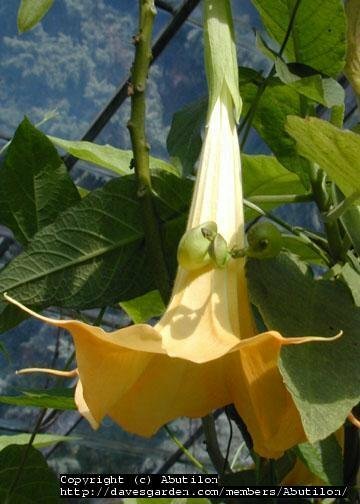 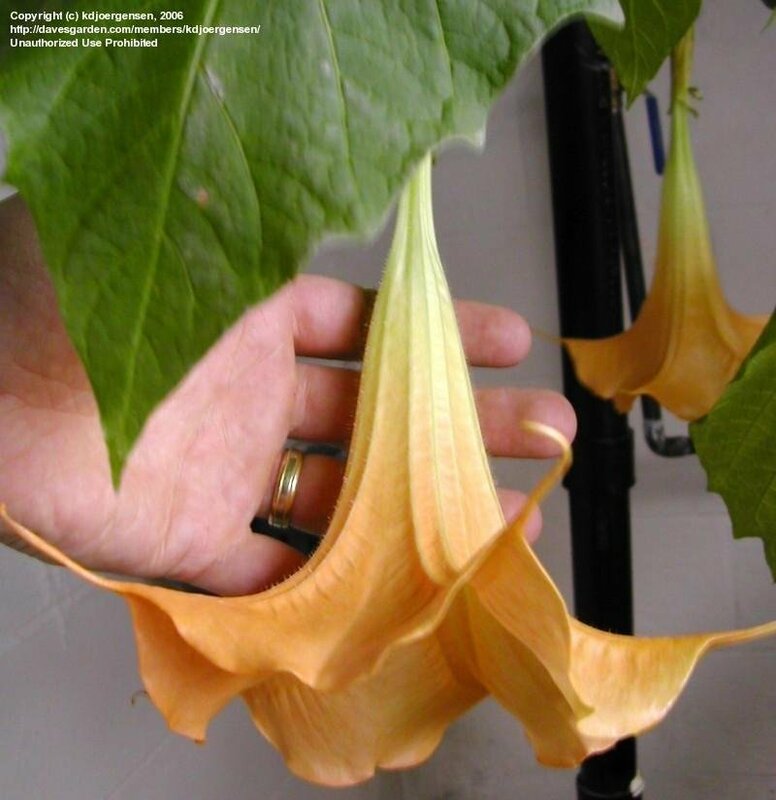 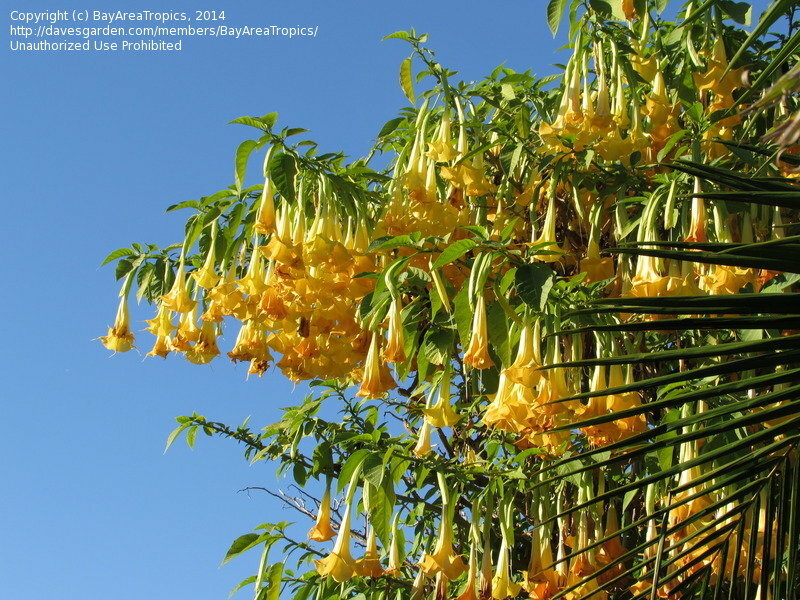 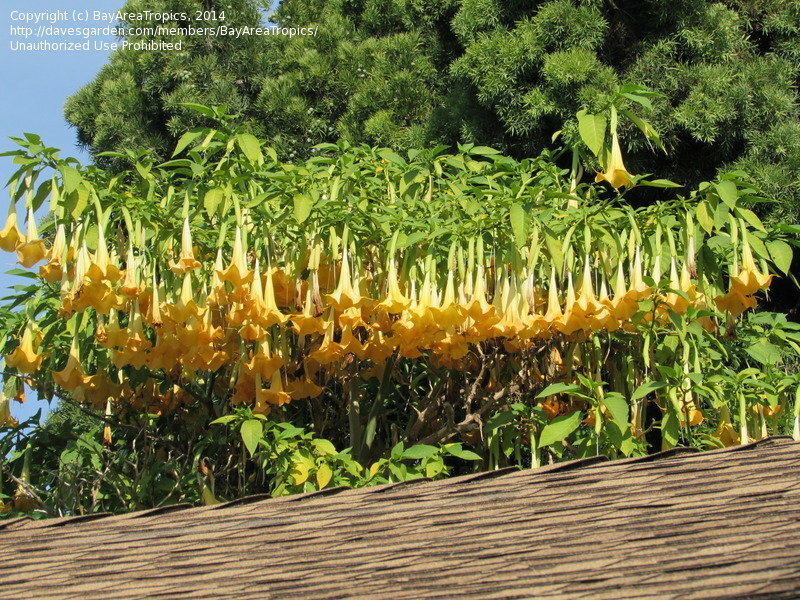 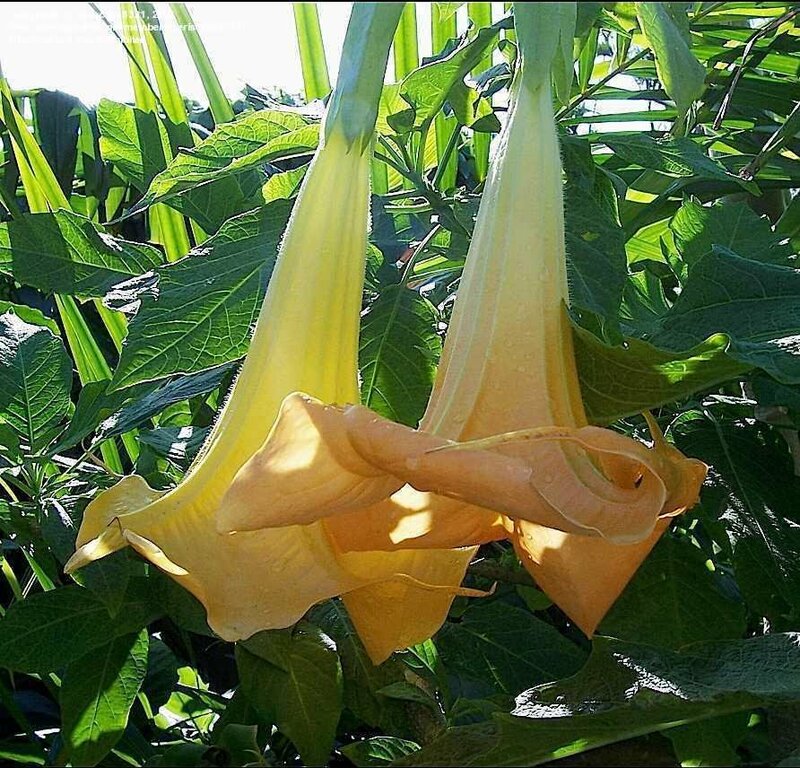 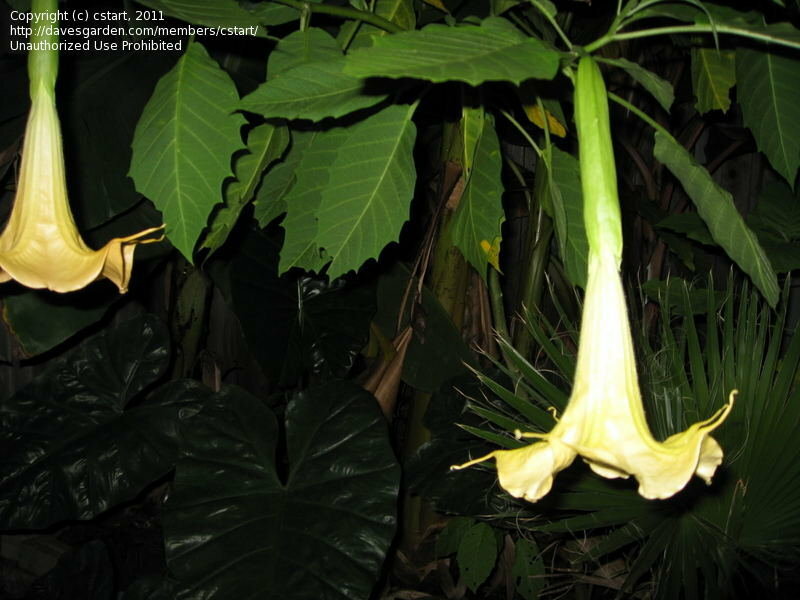 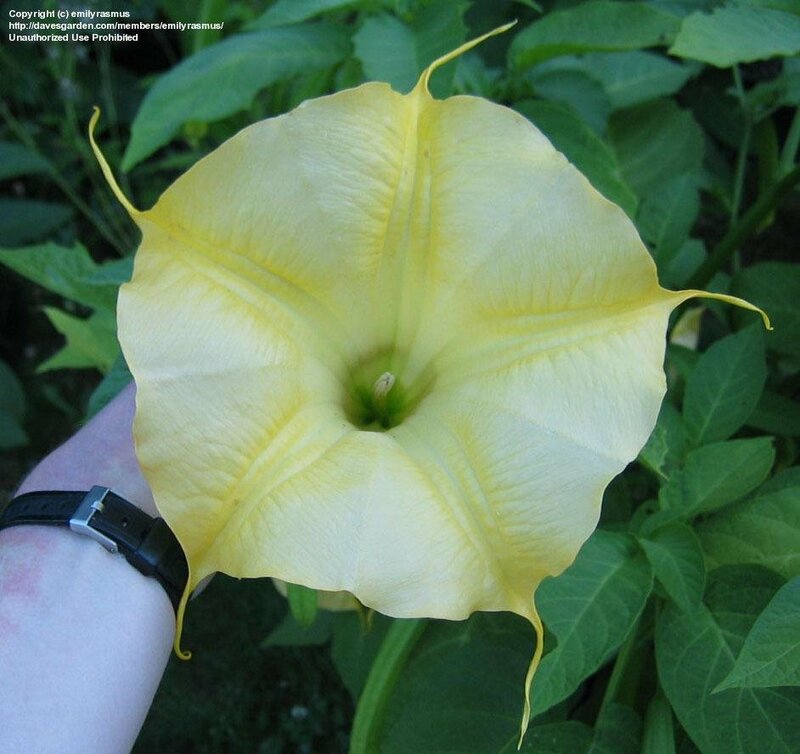 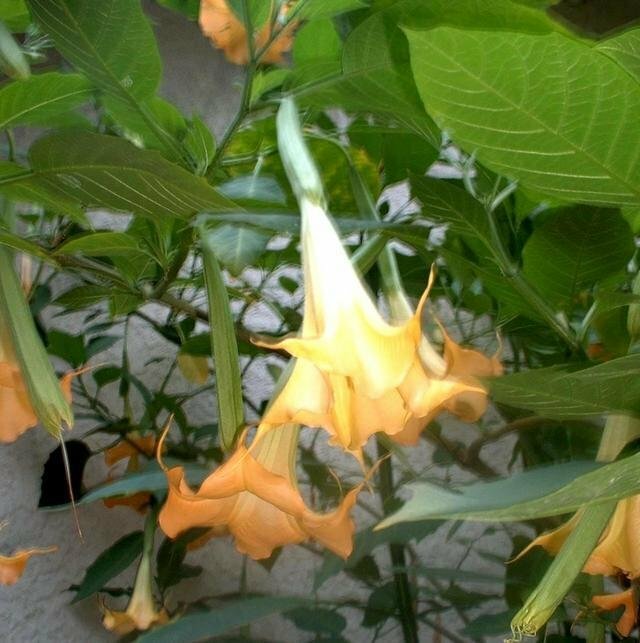 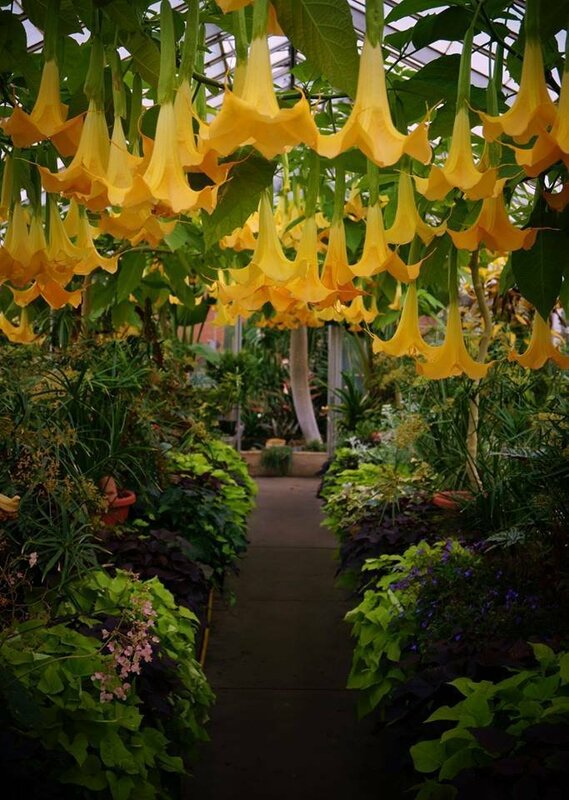 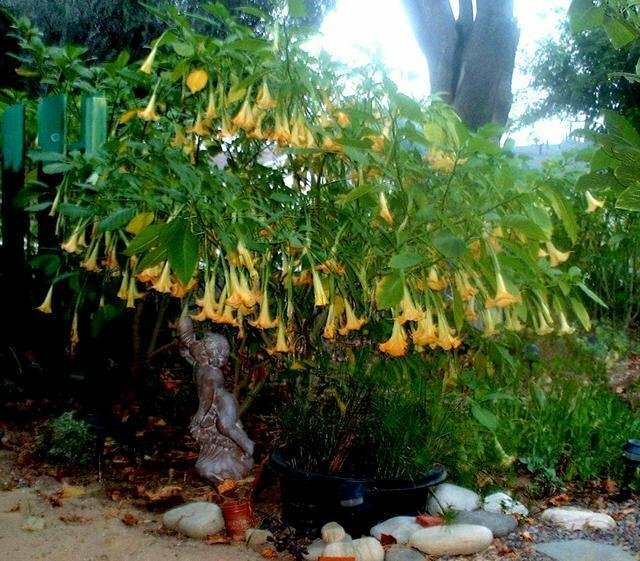 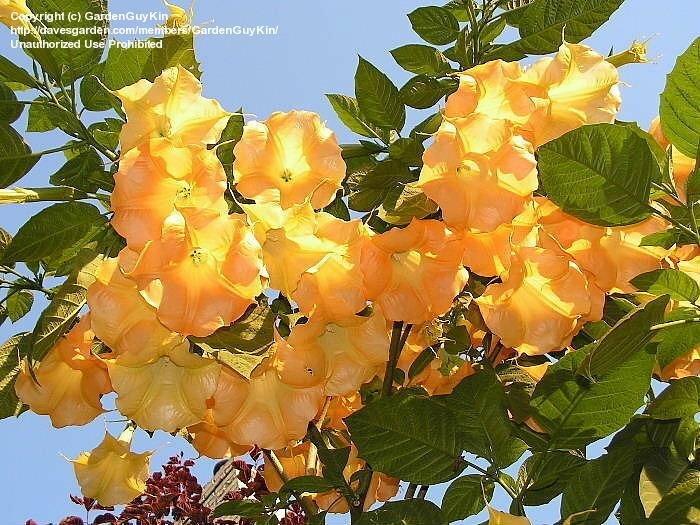 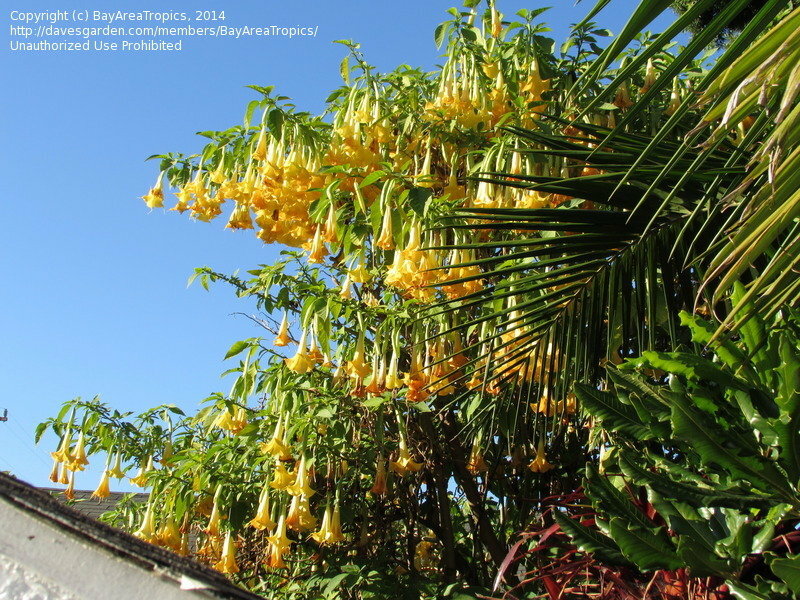 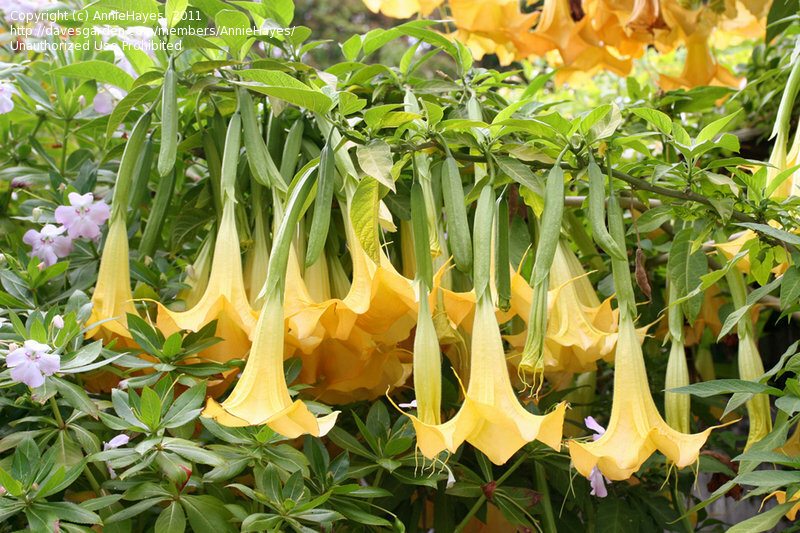 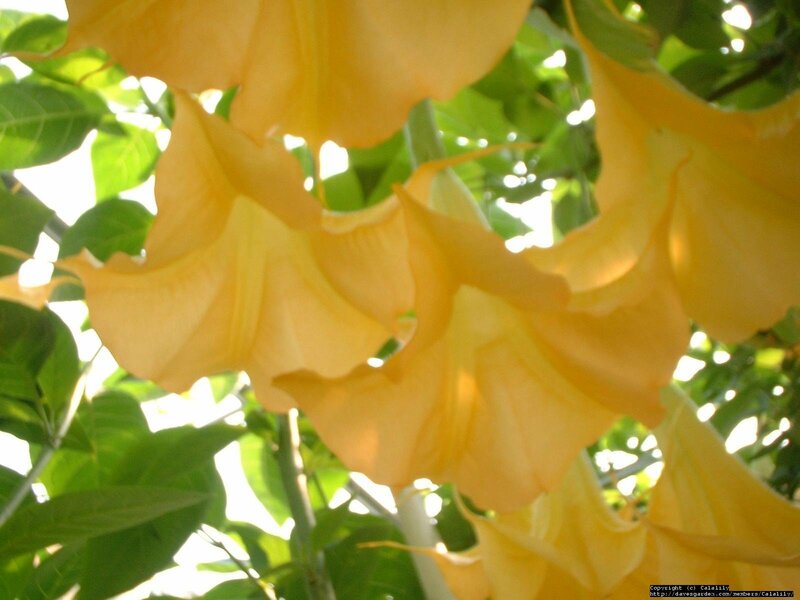 It is one of the most fragrant brugmansias. 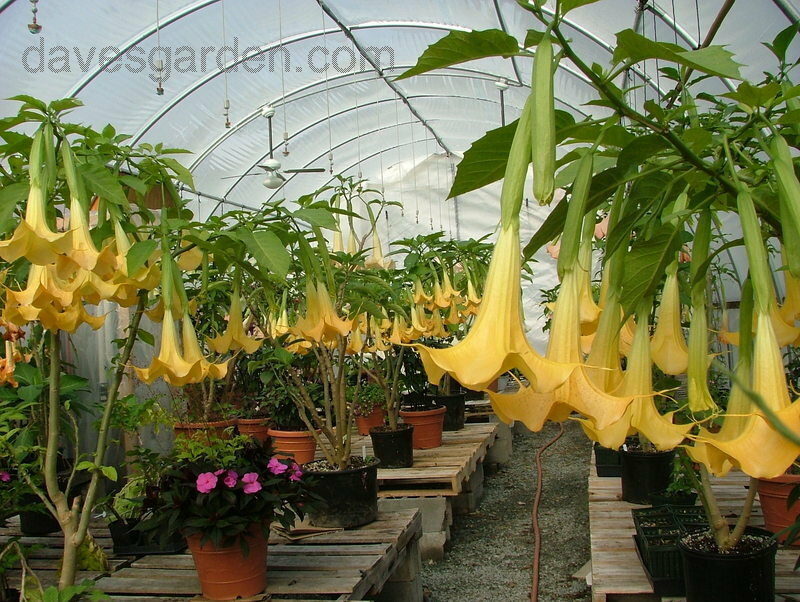 Grimaldi blooms through winter in my cool glasshouse ..many times while no leaves on the plant. 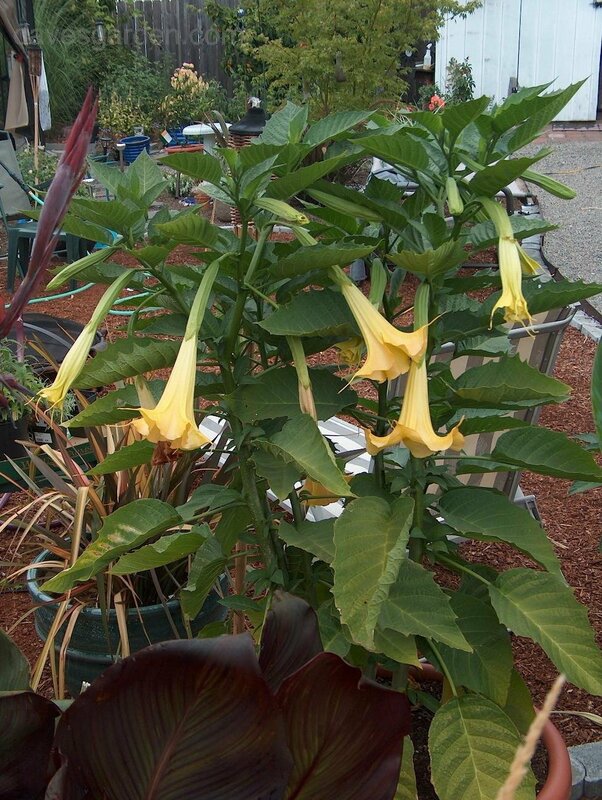 Charles Grimaldi blooming in the green house. 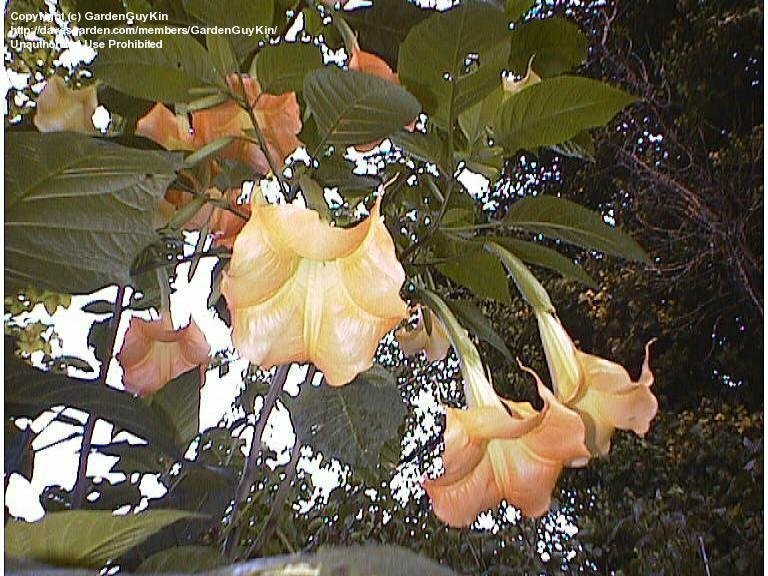 Charles Grimaldi close up of blooms. 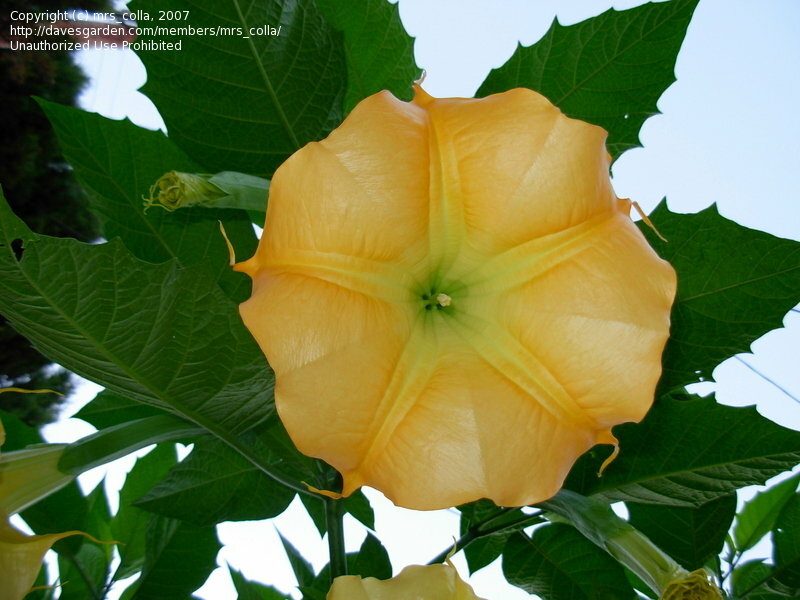 A Charles Grimaldi trained as a standard in full bud. 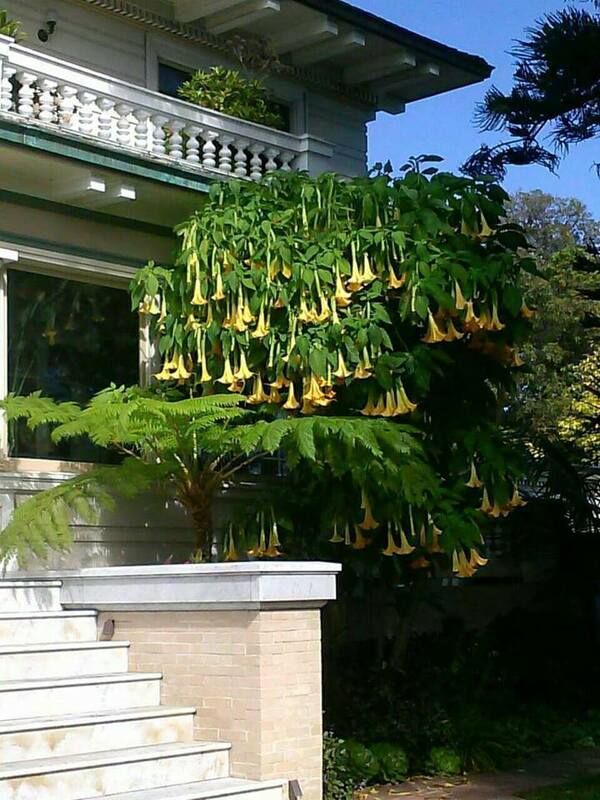 A week later it is in full bloom. 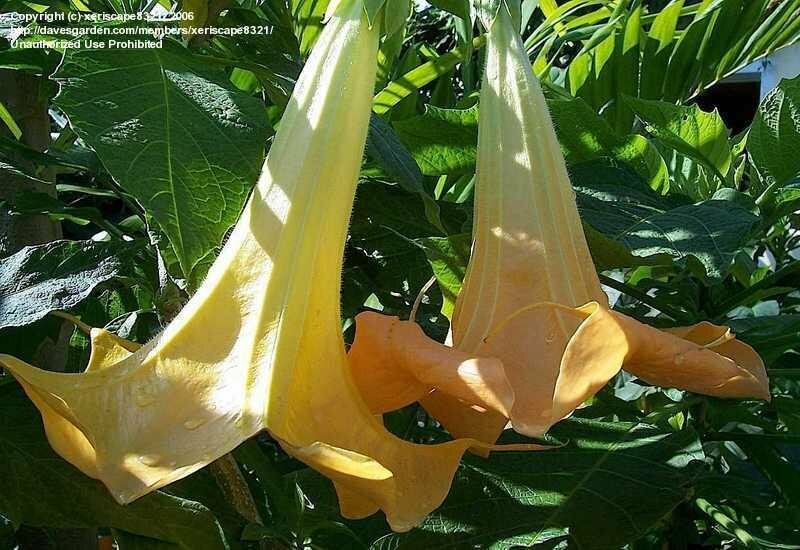 My favorite brug. 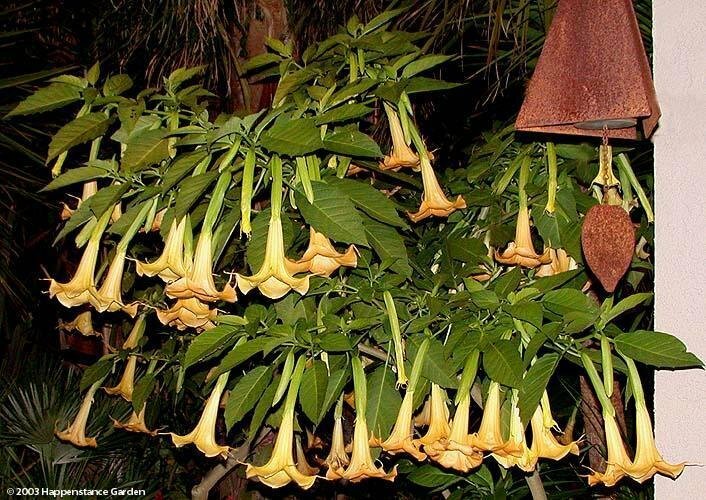 Non-stop blooms throughout the year with man flushes. 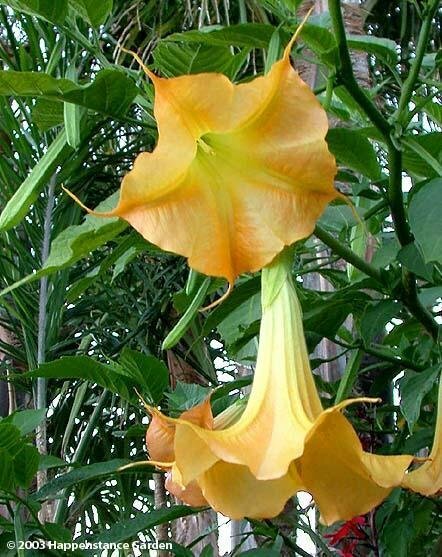 Color ranges from nearly white with orange ribs in cool weather to a deep orange with a creamy throat in warm weather. 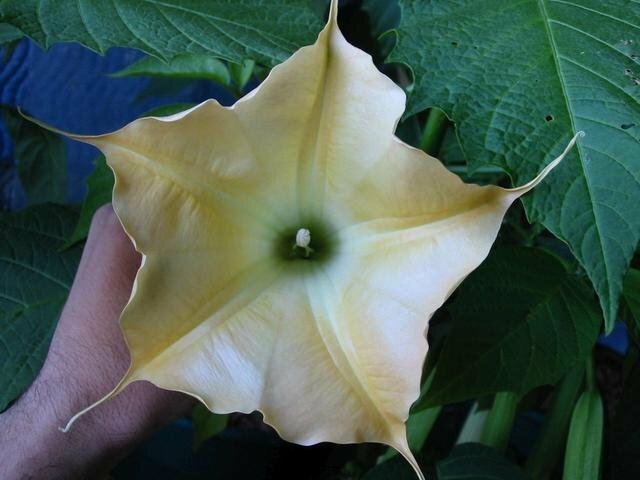 One of my all time favorite, and the first brug to bloom for me. 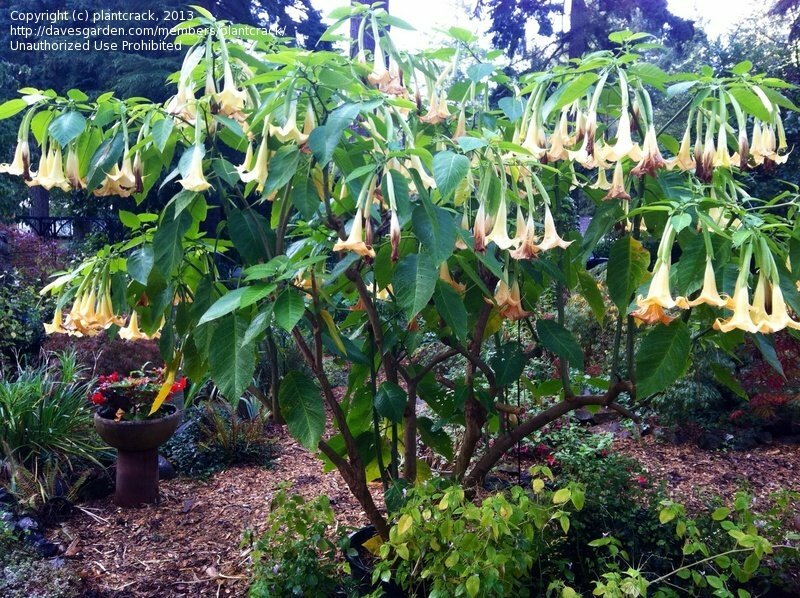 Rewarded with another flush of blooms latter part of September in Salem Or. 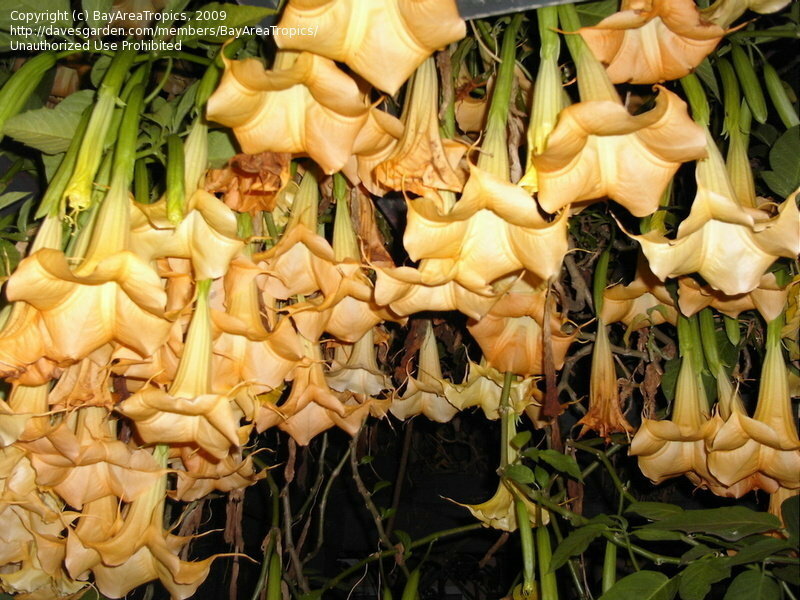 Flowering indoors in winter. 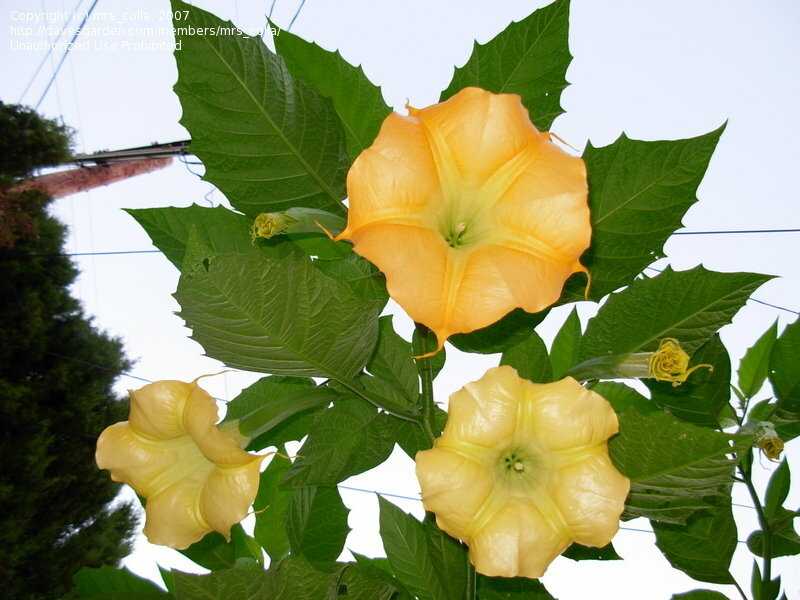 Mature flower which has turnt orange. 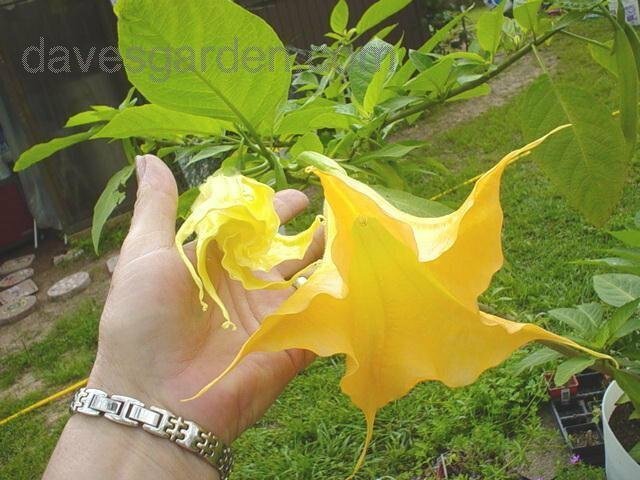 My first bloom on this one, and my first yellow.....lovely fragrance as well as gorgeous colored flowers....Awesome!! 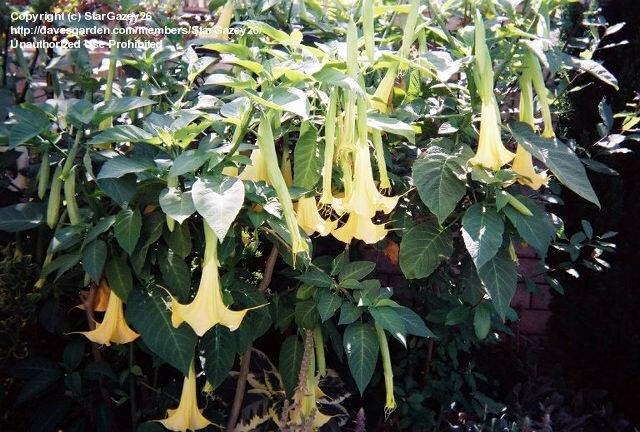 Charles G. is a vigorous grower in our climate, though, most brugs will go dormant here over the mild winter. 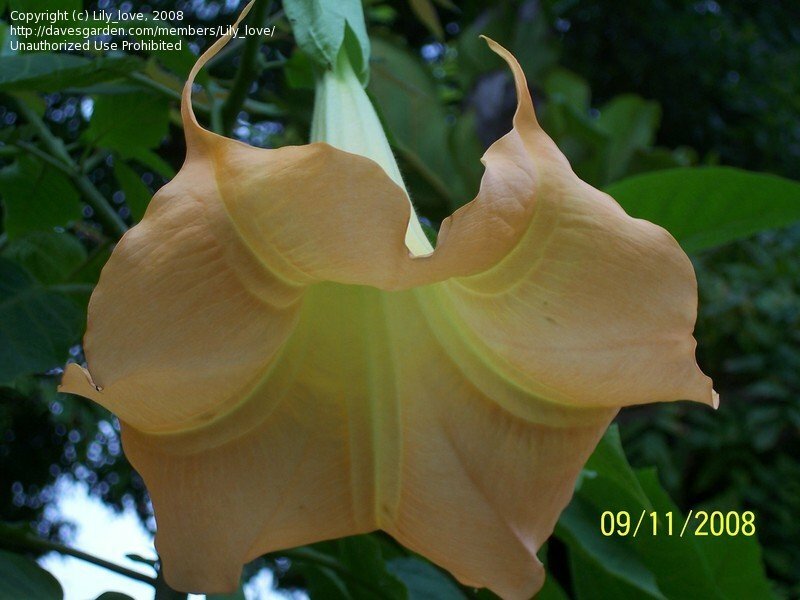 2007 photo of best bloom I ever got! 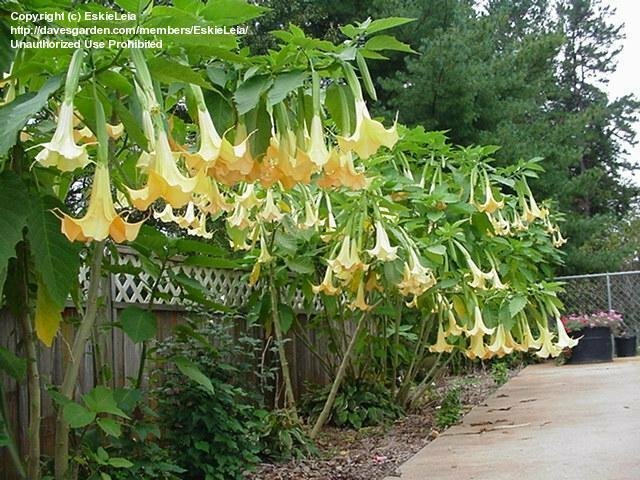 Easy & fast growing – reaching to 10’ tall its first year – it’s a marvelous choice for a small yard, especially when its sweet perfume wafts in through your doors & windows each evening. 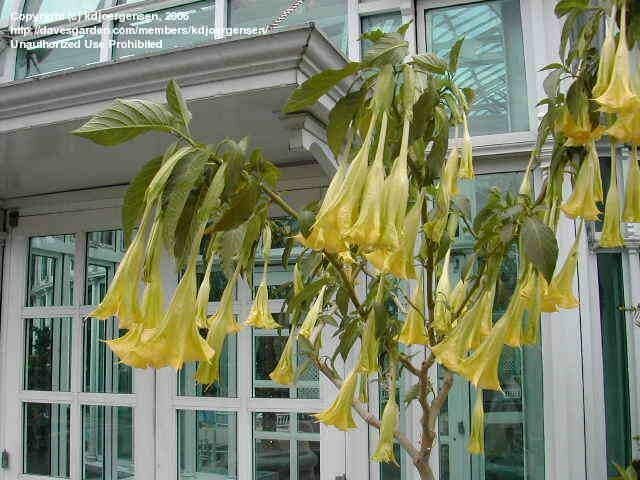 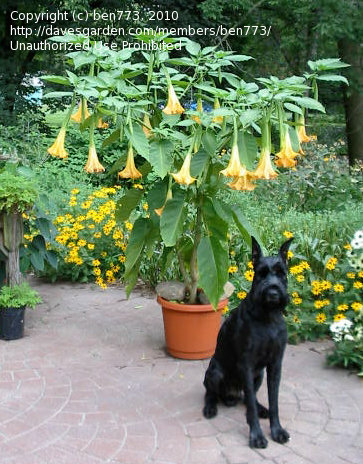 This has to be on of my favorite brugmansia hybrids. 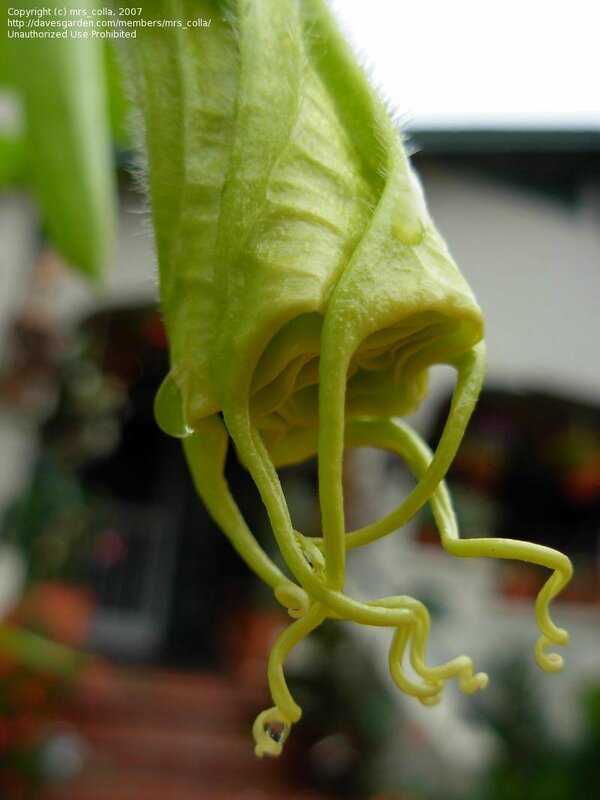 This plant is about 6 years old. 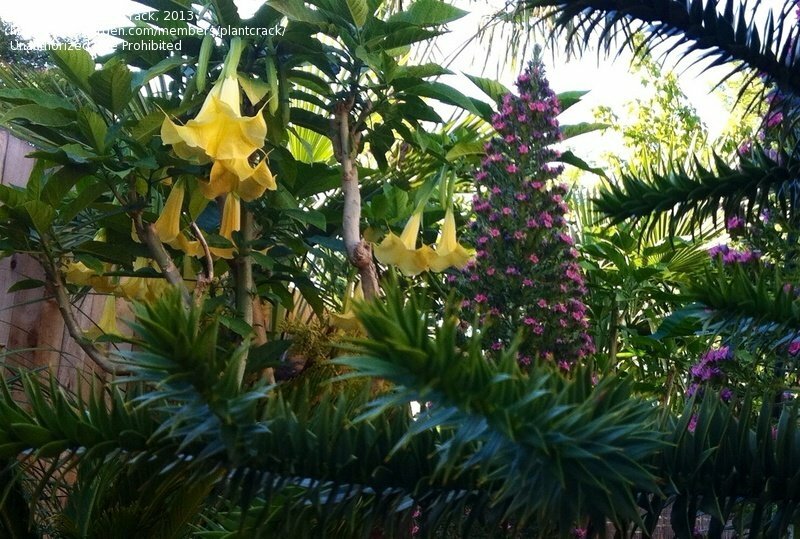 I love that this picture was taken in my back yard! 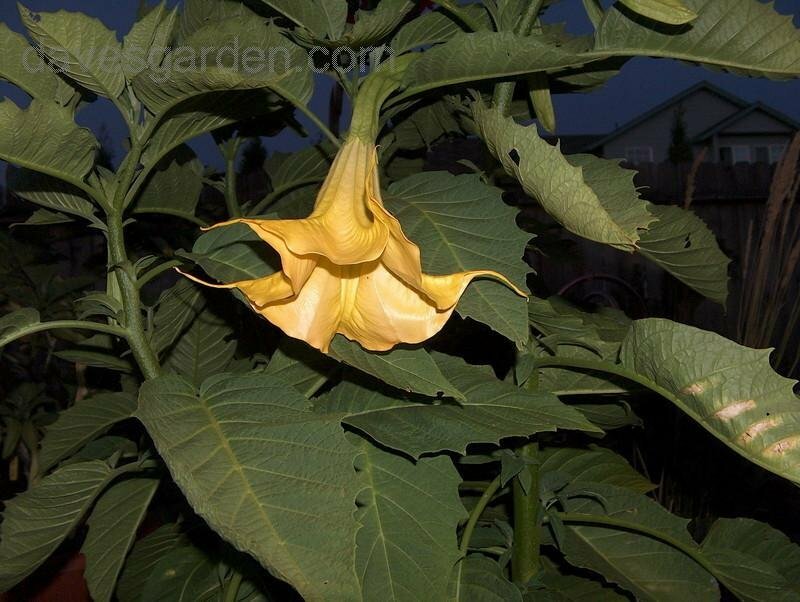 Older plant. 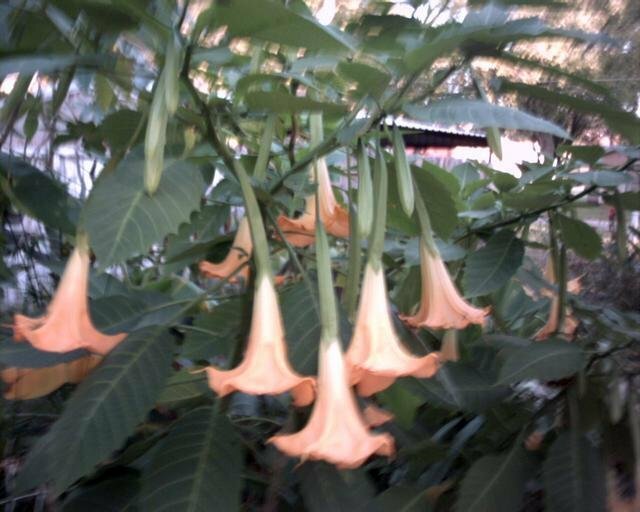 Going on 15 years old. 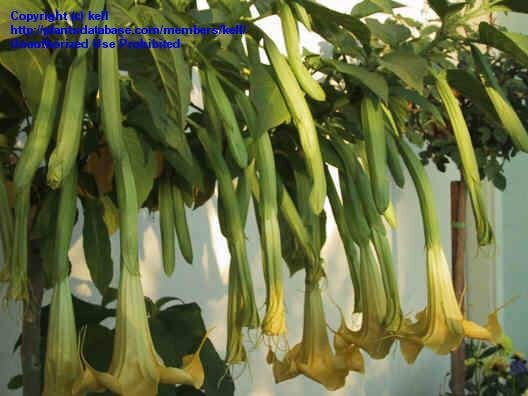 Maybe 14-16\'?